Chandra's directions are a commentary on the state of the roads in Bangalore. "Turn left at the coffee shop," he tells me, and then, "drive on till you come to a huge pothole. Try not to fall in as you turn right. I'll be waiting for you." A few minutes later, he was waving me down outside the house he has lived in for 50 years. Chandra wears orthopaedic shoes, the legacy of a motor accident a quarter century ago that rendered him virtually immobile for months. He didn't need to come out; I am touched. As we enter the house, I remember the many interesting places I have met Bhagwath Chandrasekhar over the decades. At a tailor's in Jayanagar, then a suburb (now definitely urb) in the late '60s. At a showing of the movie Jungle Book in Rex Theatre. At a civic reception following his triumphant return from the England tour of 1971 (I played the trombone in the welcoming brass band from my school). At the place I shared with a friend where he had dropped in to talk about his benefit match (he sat on a bed; my friend preserved a portion of the bed sheet!). And most startling of all, in a showcase at a Francis Bacon retrospective at Tate Britain in London. 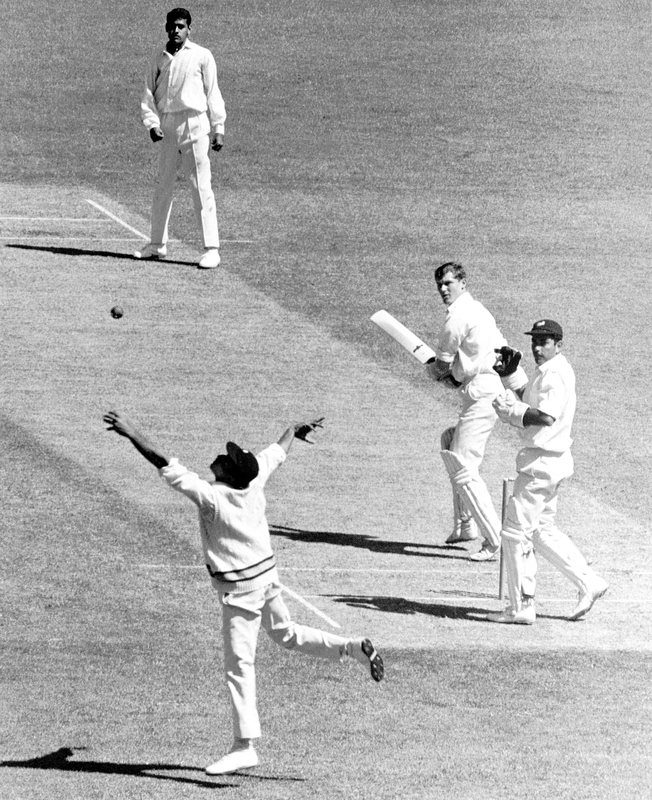 This last was a photograph of Chandra bowling to England's Roger Tolchard in a Kolkata Test. Chandra gets balletic, seemingly on the toes of his left foot as the ball is edged. 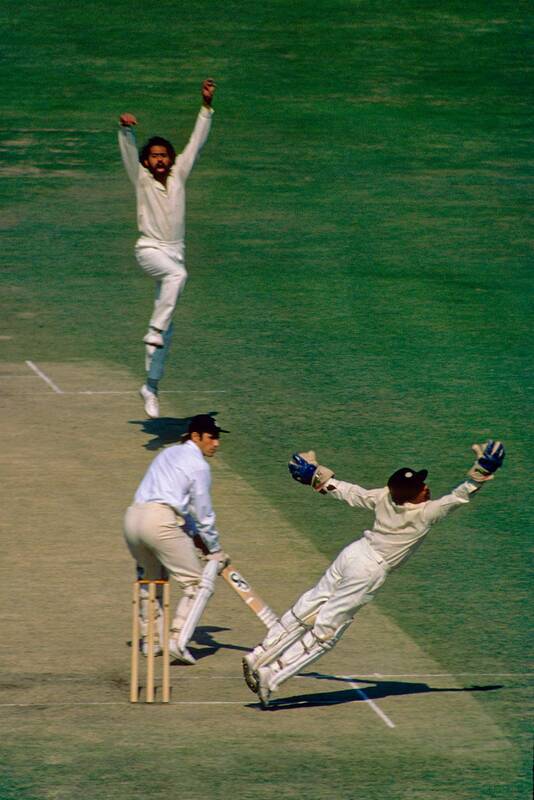 Wicketkeeper Syed Kirmani's leap to his right, again with just the toes of his foot touching the ground, is no less balletic. It is a beautifully composed shot, by Patrick Eagar, and was under the "images that inspired Bacon" section of the show. The painter who has "Baconised" Ian Botham, and possibly David Gower (there is some confusion over this) may or may not have done the same to Chandra. I asked a Bacon biographer once, but he wasn't sure. There is restlessness in the air. Chandra is awaiting the arrival of his passport stamped with a Schengen visa, but it hasn't come yet. He is off to Europe on a holiday, and telephone calls interrupt our conversation. No, it hasn't come. Yes, I am expecting it any moment. There is still time, no need to panic. He seems to be trying to convince himself rather than the callers. He is really looking forward to Vienna. "Can I get you a coffee?" he asks and disappears inside when I tell him in some embarrassment that it would be a lifesaver after over two hours on the road. I am left to admire some of the cricket photographs on the walls. Greeting the Queen in England, receiving the congratulations of Prime Minister Indira Gandhi in New Delhi. And just where the stairs begin to turn, the picture that inspired Bacon. The coffee arrives, and I sense the Chandra smile before I see it, "It was a great effort by Kirmani," he says, "but the catch wasn't taken." I narrate the Tate story, but Chandra is unimpressed. He is more excited when I tell him later how, years ago, I enjoyed a programme on TV where he sang songs from Bollywood films. His partner on that occasion too was Kirmani, and I had marvelled at the manner in which he could the hit high notes so effortlessly while seated. "That was recorded before a live audience," he says, "We had two sessions, and it was thoroughly enjoyable." "Do you keep in touch with your mates?" I ask. "Yes, I was at a function at the KSCA last week," he says, "Bishan [Bedi] calls up often." Bedi once famously said that he "saw God in Chandra", explaining there was something pure and innocent about the man who destroyed batting line-ups, the only bowler the great Viv Richards says "gave him nightmares". Chandra, 72, is in a good place. His son, named Nitin, like the son of his greatest hero, the singer Mukesh, is in San Jose, California, and Chandra is a grandfather twice over. His wife, Sandhya, has reconnected with a passion for playing the veena and gives public performances. "I am her chauffeur," explains Chandra proudly, "I drive her to practice sessions, and to performances." As if on cue, the lady herself walks in from outside. She has taken public transport today. "Hello," she says, "Did Chandra get you coffee?" Coffee for the guest before anything else - it is traditional south Indian hospitality. "Yes, he makes a good cup," I reply, as Chandra smiles modestly, and the conversation glides towards movie songs. "I love Malayalam songs," says Sandhya, and we talk of an old love song where the beau asks his lover, "Can you tune a veena?" Sandhya likes that - the question is not whether the girl can cook or converse or make love, but whether she can tune a musical instrument. Presumably if she couldn't, she'd be disqualified. Music has been Chandra's passion too. Very specific music, very specific musician. The singer Mukesh was over 20 years older and died in 1976, just a decade after meeting Chandra. But for Chandra he continues to be a living presence. "Thanks to modern technology," he says, "I have been able to dig out obscure songs he sang, private recitals he gave. I spend hours tracking and recording his music." He has no favourites, he says, he loves them all. "I often sang from 'Jis Desh Mein Ganga Behti Hain' on the cricket field, or 'Yeh Mera Deewanapan Hai', or anything that came to my mind." Chandra told Kumble, "Coaches will tell you, flight the ball more, turn more, bowl more slowly, because they cannot understand you. Have the strength to ignore such advice"
There is a famous story of Chandra once beating Sunil Gavaskar in a match with a legbreak, and following on through to the batsman. Not to sledge him but to ask, "Suna kya?" (Did you hear that? ), as a Mukesh song wafted to the pitch from a spectator's transistor. Indians of an earlier generation took transistor radios to first-class matches - and listened to the running commentary. Often they tuned in to popular stations playing Bollywood songs. The volume was turned up when a Mukesh song came on during a match involving Chandra, or a song involving Sharmila Tagore when her husband, Tiger Pataudi, was in action. When players acknowledged the tribute, the crowd roared. It was a way of connecting with the stars in the pre-television and pre-selfie days. Chandra's passion for Mukesh's music converted many of his friends. 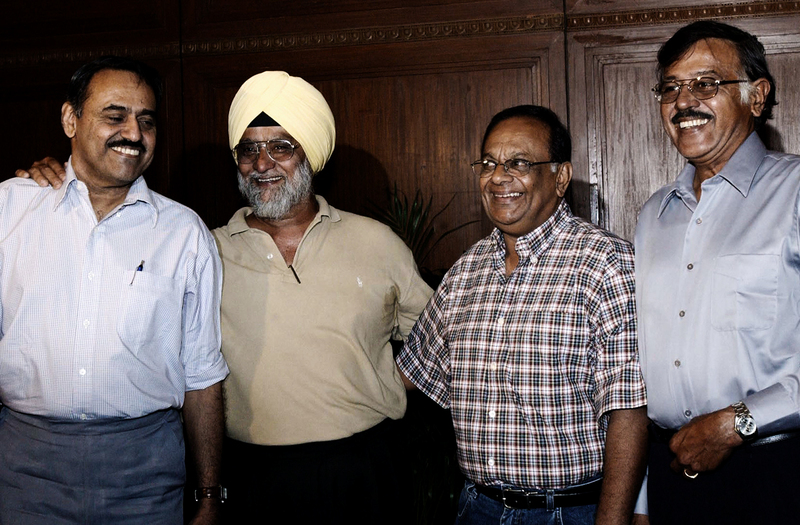 Kirmani, Gundappa Viswanath, and even some journalists. You didn't have to be a Mukesh fan to be in Chandra's inner circle, but it certainly helped. Gavaskar has written about how he sometimes hummed a Mukesh tune on the field to inspire Chandra. Gavaskar had also told me about Chandra's backlift as a batsman. "He might have scored all those zeroes," he said, "but watch his backlift. The bat always came down straight." I ask Chandra about this; he laughs. "This is true. Sunny and I got into this discussion during some games in the US. Usually I never stayed at the crease long enough for anybody to notice my backlift." I joined in the laughter this time, knowing he had more wickets than runs in Tests, 242 to 167. "Hey, I nearly hit a six at Edgbaston," he suddenly recalls. This was in the course of his highest score, 22, in the only Test featuring all four spinners of the great quartet - Bedi, Erapalli Prasanna, Srinivas Venkatraghavan and Chandra. No bowler, not even Chandra, wants to be seen as a poor batsman. After all, he played as an opener in school, kept wicket, and later bowled medium pace too. Perhaps the weak right hand helped this one aspect, the backlift, of Chandra's cricket more than any other. Perhaps this is just another one of those convenient theories. "I have heard all kinds of theories about my hand," says Chandra, "That I have no bones, that my wrist can turn around 360 degrees, and so on." Chandra always wore his sleeves buttoned down on and off the field; his right hand was so weak that he often had to support it with his left when he wasn't bowling. He threw with his left hand, and as an adolescent, contemplated becoming a left-arm spinner. "I could not have bowled left-arm spin because my non-bowling arm would have been of no help," he says. Once, many years ago, I stayed over at Chandra's house after a late-night outing. We were both bachelors for the evening, as Chandra's wife was out of town. I saw him without a shirt on. Let alone bowling legbreaks and googlies and topspinners. It is amazing that he can actually hold a ball in his right hand, or a pen even, so emaciated does it look. It took extraordinary courage to step onto a sports field - he had the attack of polio that left his arm withered when he was five or six. In his teens, he went from club cricket to first-class cricket to Test cricket in the space of six months. He was 18, and had to evaluate what worked best for him. Success came from self-awareness. Soon after Chandra's Test debut, Pataudi told him that he would be India's main strike bowler. Chandra smiles at the memory of a team led by a player with one eye, and a lead bowler with one arm. Yet nobody noticed these drawbacks or were even conscious of them when these two high-class performers were in action. After he saw Chandra in action, Yagnanarayan invited him to join City Cricketers. It didn't happen immediately because, says Chandra, "I found the joining fee of two rupees too high"
Chandra was lucky to have captains who understood him both as player and person. He describes it evocatively: "You know the four stages of the butterfly? It was like that with me. At the egg stage, I had my parents and Yagnanarayan, who led me to my club, City Cricketers; at the larva stage, there was V Subramanyam, captain of Karnataka. Then came the pupa stage where ML Jaisimha led my South Zone team, and finally as an adult, I had the fortune of playing under Tiger Pataudi." Chandra as a butterfly is an apt image; delicate, gentle, inspiring. He was probably the only player who nursed no ambitions of leading India. "I did lead Karnataka once or twice," he recalls, "to this day some of my team-mates remind me of how I finished an over, then went and stood at third man as usual, till someone reminded me I was captain and needed to decide who would bowl from the other end!" I always thought Chandra would have made a good coach. Time spent in his company talking cricket is always rewarding, and I have usually found his insights on players spot on. "X will play for India," I would say watching a young player in action, and he would come back with why that might not happen, and events would prove him right. "Coaching is a different game today," he says. Yet it was Chandra who gave Anil Kumble, India's most successful bowler, the advice that made the difference. "I asked him to lengthen his run-up." More importantly, he told Kumble, "Coaches will tell you, as they told me, flight the ball more, turn more, bowl more slowly, and a whole lot of things, because they cannot understand you. Have the strength to ignore such advice." "You know," he says, "I held the ball like a medium-pacer, on the smooth side along the seam, not across it like spinners. It felt natural, and may have accounted for the bounce off the wicket." No coach would have allowed a spinner to grip the ball like that. Luckily no coach tried to force Chandra to change anything. Yagnanarayan, a patron of cricket in Bangalore, sometimes gathered a team to play local tournaments. After he saw Chandra in action, he invited him to join City Cricketers. It didn't happen immediately because, says Chandra, "I found the joining fee of two rupees too high." Chandra was a mystery both on and off the field. "I needed just two fielders," he says, "a slip and a short leg. If I was bowling well, I didn't need anybody else. If I was bowling badly, 22 fielders would not be enough." It has never been easy for Chandra. India played 84 Tests in the 15 years that his career lasted, but Chandra played in only 58 of them. One-time chairman of selectors Vijay Merchant thought he was "a freak" and didn't pick him for India's first triumphant tour of West Indies in 1971. His selection for the England tour that followed was "a risk" in Merchant's words. Yet it was his 6 for 38 at the Oval that won the Test and series for India, a first. Seven years later, his 12 for 104 (6 for 52 in each innings) in Melbourne led to India's first Test win in Australia. What excites him today about the Oval Test? "I bowled a faster one to John Edrich and hit his stumps," he recalls. "The newspapers got it wrong calling that a googly." In fact, it was the famous "Mill Reef" ball. Mill Reef was a champion horse in England, tracked by Chandra and Dilip Sardesai. It was Sardesai who named Chandra's faster delivery Mill Reef. Chandra tells the story of how he had planned to bowl a googly to Edrich when Sardesai came up to him and said, "Mill Reef dalo" (Bowl a Mill Reef). "I changed my mind and bowled the faster one. Edrich could not bring his bat down in time. In my mind's eye I saw the stump cartwheeling and reaching the pavilion ahead of Edrich, but of course that cannot have happened!" For such a successful international bowler, Chandra had to live down the impression of being someone who "didn't know what he bowled". Even today, short biographies of the man insist that he was a great bowler because of this: if the bowler didn't know what he was bowling, how would the batsman know? I think the canard originated with the great Australian bowler (and a prototype of Chandra) Bill O'Reilly, who first said something like it. It was cute, romantic, Cardusian. And like some of Cardus' comments, it was fanciful. It is unfair, and makes no sense either. You don't pick up over 200 Test wickets without knowing what you are doing. Chandra was a mystery both on and off the field. "I needed just two fielders," he says, "a slip and a short leg. If I was bowling well, I didn't need anybody else"
My first boss, Rajan Bala, would wish all kinds of curses upon the head of anyone who thought Chandra didn't know what he was bowling. The bowler himself alternated between amusement and irritation in the days when the three of us would spend an evening going yo-ho-ho with a bottle of rum. Chandra's wife returns to the room. "Stay for lunch," she says, and Chandra nods in agreement. But I am meeting someone for lunch - the same friend who had cut out a portion of the bed sheet Chandra had sat on all those years ago. "That's not all," my friend tells his wife when I tell her the Chandra story. "I didn't wash my hands for days after shaking hands with Chandra." 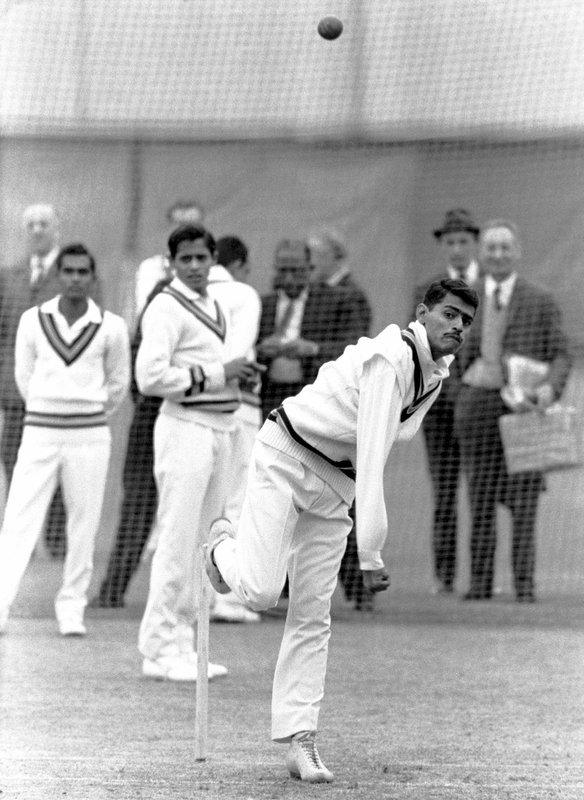 In Chandra's final Test, Kapil Dev claimed his first five-wicket haul. There is a neat symmetry about the passing of the baton from one strike bowler to the next. "We must meet more often," Chandra says, as he sees me to the door, and then to the car. "You don't need to," I tell him about his accompanying me out, but he only smiles. Some passers-by walk on, then stop abruptly to turn back and look. There is a sign of recognition on their faces, but they don't rush to take selfies, merely allow the great man to walk back slowly into his home of half a century.